These are antibodies designed to bind to a “hormone” that your eye is producing that participates in the formation and leakage of new blood vessels underneath and in the retina called Vascular Endothelial Growth Factor (VEGF). By decreasing the amount of VEGF in the eye we are able to decrease the amount of swelling in the retina and hopefully stop and reverse the growth of new blood vessels. By decreasing the swelling we restore the architecture of the retina and hopefully improve vision. These medications are injected directly into the eye through the sclera (white part of the eye) into the vitreous cavity behind the lens initially every month. 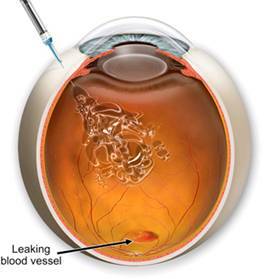 We use monthly injections until we achieve a dry retina, then we attempt to space out the injections as far as possible. Our goal is to keep the vision as good as possible, retina as dry as possible and give as few injections as possible over time. Wet macular degeneration is a chronic disease that will require close monitoring and treatment for the rest of patients lives. Roughly 1/3 of patients receiving Anti-VEGF treatment will have an improvement in vision of 3 lines (for example 20/60 to 20/30). Ninety percent of patients maintain the same visual acuity within 3 lines of where they start and ten percent continue to worsen on treatment. The main risks with intraocular injection are an infection, bleeding, and retinal detachment. The most serious of these is infection within the eye and the rate of occurrence is somewhere between 1/1000 and 1/5000. Macular Laser is used to burning the retina and the abnormal blood vessels. It was one of the first treatments used for Wet Macular Degeneration. Originally it was even used in the center of vision and resulted in an immediate loss of vision. This was thought to be a good trade-off since the vision then stabilized and was better 5 years later compared with eyes that were not treated. Macular Laser can be considered for use on new blood vessels that are outside of the very center of vision, the fovea. The laser will cause a blind spot in the vision but when used outside of the fovea should not result in loss of visual acuity. New blood vessels come back after the laser ~50% of the time. The macular laser can be considered in combination with Anti-VEGF treatment in certain instances.